Wow, Sorry it has been so long. I has been a bit busy around here these days! Makenzie is doing well! She got her new walker and has improved a bit every time she gets in it. 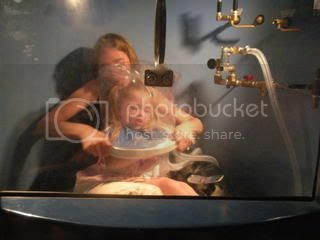 We finally got a chance to do water therapy on Friday with Makenzie's PT. She did so good! 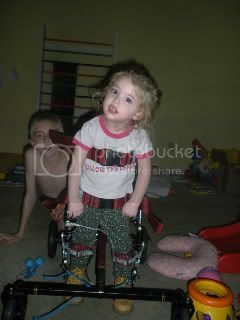 She was kicking her feet and was able to move her legs on command to her therapists hands! All while Josh was busy doing front flips off of the diving board!!! We had a family picnic on Sat. at the farm where my grandma grew up! I was hot but so much fun to see where she was born and grew up! The house is 88 years old and was really small. My grandma came from a very large family and it was so hard to imagine craming all of those kids in that little house! The last time we had a picnic there was when I was about 8! It was fun to be there with all of my family! 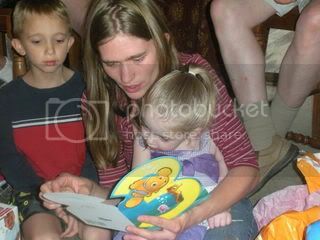 It was also great to see and hear froom so many people that continue to pray for Princess Makenzie! Thank You All! We are leaving for California on the 14th! I am so excited! I still have to get all of the Miracle Flight paper work together tonight so that we get it faxed in time for them to find us a flight! Thank You Miracle Flights for makeing all of these trips possible! 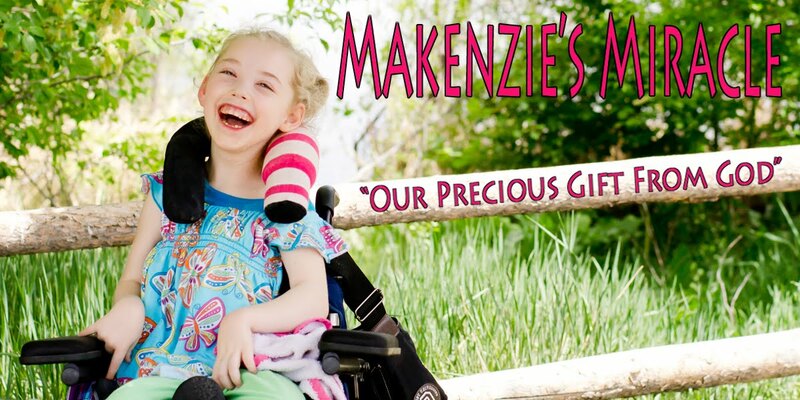 With out this organization we would be much more limited in where we could go to get treatment for Makenzie! THANK YOU!!! I have also been researching a organization called NACD. They deal with Child Development. I ordered a CD lecture and it was GREAT! There was so much information and all 6 hours were packed with all kinds of very important suff! NACD evaluates kids from coma to briliant and then gives parents a protocal on how to simulate the child at their level to help the brain reconnect and reorganize! I am in the process of filling out the paperwork to have an initial phone eval befor going to AZ (AGAIN!!!) in person! I am so excited to have all of this new information and another great treatment option!!! How to stimulate Makenzie has been a stuggle for me and some very pointed direction will be GREAT!!! Well I guess I will have to cut this short tonight! Makenzie is very restless and I think to get her settled I will have to be off to bed! I guess a little extra sleep can't hurt! Keep praying!! Prayer Works! 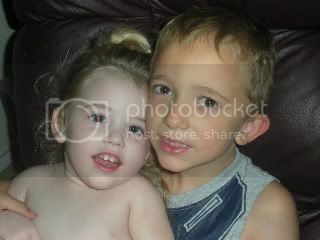 Kaleb has been asking for a picture of him and Makenzie for this blog. So here it is! She is looking a bit chubby! Yeah!!!! Not much happened this weekend. We went to the pool a few times, played in her new walker, went to the first service in out new church building, went out to lunch with some friends we haven't seen in a long time, and played out side in the water. Makenzie thought it was grat to be sprayed with the hose! Her feeding tube seems to be feeling a bit better! Please keep praying that this would continue to heal quickly as it is causing her a lot of pain. Well that is all for tonight. Keep praying for Miss Makenzie! It only took them about 3 weeks and now it is here and ours to keep! It is amazing how much Makenzie has improvered in thoughs few short weeks! She did great with taking steps and bearing weight! I am so proud of her! Her button is a bit red and seems to be causeing her some pain! Please pray that this would get better fast! We had a crazy week this week but I don't see much on the calender for next week but normal therapy and going to the pool! Keep praying for Makenzie and her recovery! Got to get some sleep! Cranky little girls are tiring! We got the final details taken care of for our trip to California! 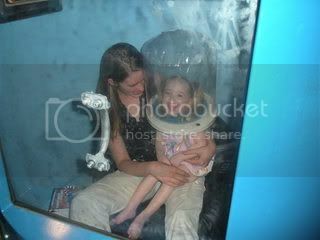 We are going to pick up Makenzie's Neuro Suit! Two of Makenzie's therapists are going to come with us to be trained with me on how to use it so that we can do suit therapy at home instead of spending thousands of dollars and three weeks two-three time a year to go to a clinic! I am so excited! We are going Aug 14-17th! I can't wait to get Makenzie bak into the suit! I also taked to the intake person for the Feeding Clinic in VA today! She will be calling tomorrow to set up and eval in Sept! We will be traveling VA for this as well. Hopefully they will accept her into their program and we can do some very intense feeding therapy next May! The program is 8-10 weeks long so I am hoping to find a month to month apartment to rent and have my boys come out the last 4 weeks! 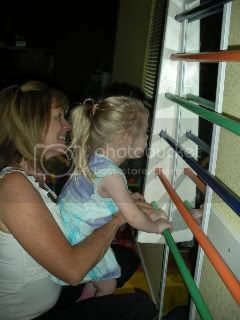 This clinic has produce very good results in tube fed kids and has come with wonderful reccomendations! I scheduled another Swallow study in Aug. as well so that we can have an updated one to bring to our evaluation. Please pray that she does well for this! Last time she did ok. They didn't get many swallows as they had her in a weird chair, between 2 peices of x-ray equipment, with like 8 people standing around her...... very intemidating! What she did swallow there were no signs of asperation or pooling! This time we hope for more swallows with the same results! Makenzie had a great day in therapy. We got her to continue to bear weight into both arms and she sat well today. She is also doing really well getting her hand above her head to roll and putiing her head up with weight into her shoulders on her stomach! She is doing so well!!! Please keep praying! God is Good and Prayer works!!! Believe! 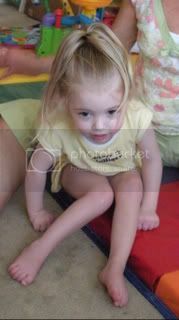 Here are a few pictures of Makenzie sitting! The really special thing about these pictures is that she had both her right and LEFT hand down and bearing weight! Yeah God!!! HBOT is still going well. It seems to mske her really tired though! We have also had some good results with changing her feeding schedule around. I have been feeding her a couple time a day and she has been eating 1-2oz!!!! GO MAKENZIE! Our goal is 4 oz so we are bout half way there! At 4 oz we will reasses and take more tube away and try a new goal amount!! Pray that she continues to do well and improve with her oral motor and feeding skils! 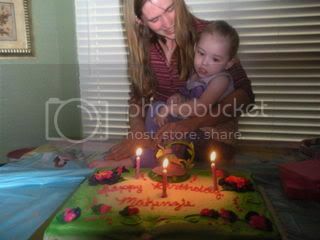 Makenzie is 3!!! Last year we were in Pheonix for her birthday. Last year I let Makenzie taste a small lick of frosting as she had just started to be able to move food to the back of her mouth. This year she will get to eat cake! Modified a bit with some milk but none the less she can do it!!!!! Last year she was not smiling or laughing. This year she will be with all of her friends and family with a big smile on her face! 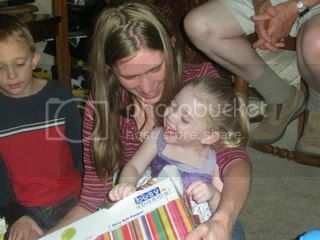 Last year she could have cared less about toys and this year I went to pick out presents that I knew she would LOVE! She still won't be able to blow out her candles but she will look at them in wonder! Last year she wouldn't have even noticed the candles! I ordered her a Tinkerbell Cake because she loved the Peter Pan Ride at Disney World! I can't wait to see what she thinks of a big bunch of balloons! As much as I wish things were different I can't but be so thankful that I get to celebrate another year with my princess! Thank You Jesus! To God be ALL the Glory! 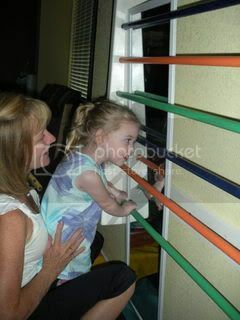 Makenzie has been doing great in therapy! 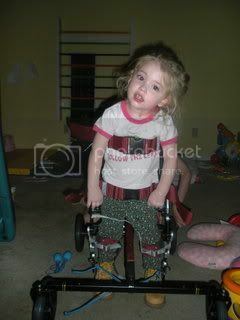 She has continued to push herself up with her arms on her stomach ans is still doing well with sitting. We had a new OT start on Weds. She is great and I think she is going to be GREAT with Makenzie! We went to our feeding eval and I was very dissapointed, to say the least! They were very unhelpful and told me nothing that I didn't already know! Their grand conclusion was that Makenzie needs feeding therapy! Gezz really! So I went to her GI and we talked about her feeding schedule. We are going to cut 2 hous off of her feeds per day and he wants me to try and feed her 4 oz oraly. When we get to that new goal we will begin to add more oral and cut more tube feeds untill we can slowly widdle it down to her only eating through her mouth! Boy that will be a day for another party!!!! I am so greatful that we have such a wonderful GI doctor! Well of to make formula and get to bed! Thanks for you thoughts and prayers! We finally got the chamber running!!!! 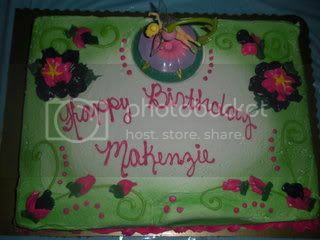 We got Makenzie in there with no problems!!!! We have been trying for about a week and she was freaking out because of the noise. Today there were no tears! It was just HOT! She is such a trooper! 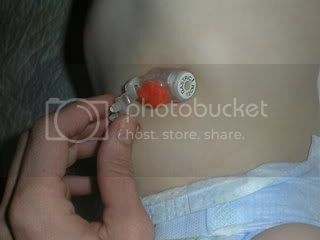 We were going to go see fireworks tonight but right befor we left her j tube button broke! I spoke with 3 doctors and they all said that there was nothing they could do untill tomorrow! Oh well! We had acid everywhere and they said it would be ok but it is such a mess! Your body produces it all of the time so it would have just kept leaking untill we had it fixed...... tomorrow! So I took things into my own hands and pluged it with PLAYDOUGH! No more leaking!!!! He He I am sure they will look at me funny tomorrow at the doctors but at least we both won't be covered in acid!!!! I tried feeding her through the g (stomach) port but she seemed to be a bit uncomfortable so I stoped but she hasn't thown up yet so that is plus! Well that is all I have for tonight! The adventures of Makenzie always have me on my toes!!! It is amazing what you can come up with in a pinch!!! Keep Praying! Just a quick post! Makenzie is still up because we had a great private fireworks show at the neighbors house! 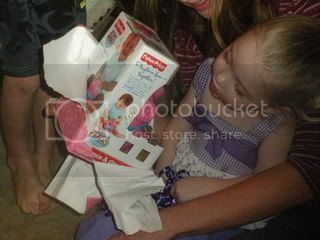 Makenzie loved it! The louder is got the more she laughed! It was so cute! She even got to hold a sparkler! We went to the pool for a while and I put her in a float. She did great holding her head up and a couple of times she put her face in the water and she did great! She picked her head up and either spit the water of swallowed it! I am very careful in the pool with her face and the water but it is the pool! She loves to be splashed and throwen up into the air to land in the water! She loves the pool! On tues we have an appointment with the Childrens Feeding Clinic to get started with the weaning from the j tube and back onto bolus feeds so that we can start an intenssive feeding program! Hopfully she won't be to intimidated by being in a new enviornment and will show them her stuff! She is now 24lbs 11oz! and looking GREAT!! Our goal was 24lbs so I am thrilled that we have surpassed that by almost a pound!!! Go Makenzie and Thank You Jesus!!! Please pray for this appointment!!! Makenzie is also doing very well and continues t sit well! She is also putting a lot of weight into both of her arms!! This is so great!!! Well I better get my princess to bed!!! Keep praying!